When you’re raising kids, time flies. This is especially true when you are raising bilingual kids. Every day is an opportunity, and when my kids were young, I felt as if there was never enough time or quality exposure. The ideas below are effective ways for parents and teachers to engage Spanish learners with language. If you are teaching kids Spanish at home or at school, be sure to check out our Teach Kids Spanish: Resources and Strategies page. You’ll find lots of helpful, inspiring information. Try doing more of these 5 things to ramp up the quality of language learning in your home or class. Music enhances memory, teaches vocabulary, grammar and culture, and makes us happy. So, fill your days with Spanish songs. Don’t stop there though. You can build on the language in the songs in countless way. If you actively engage kids with the language in a song, the learning increases dramatically. Here are a few ideas to get you started. Make a picture collage or drawing to illustrate the song. Transfer the language by singing specific lines in other situations. Read more about this below. Print the lyrics or favorite lines and frame them, illustrate them, or put them on the refrigerator. Start a song journal with favorite lines (or complete lyrics) and illustrations. Research places and people mentioned in songs. Learn something about the artist and listen to more of her songs. If appropriate, follow artists on social media. Read about them and let them know you like their music! Read Songs to Teach Spanish: 40 Ways to Sing and Learn for more ideas about how to build on music to learn language. Books, videos and songs are full of catchy, repeated phrases, so add them to your routines, conversations and games. Use the same voice or tune to make the reference clear. There are lots of songs for young learners that are perfect for this. The song Ponte tus zapatos by Super Simple Español is a great example. Once your child knows this song, you can sing Ponte tus zapatos (or the other clothing in the song) or modify it to fit what your child is wearing. The Date prisa line is also an easy one to transfer! Books also have lots of language you can apply in other situations. For example, if you have a little one, read the Spanish version of the classic book Brown Bear, Brown Bear, What Do You See. Later, substitute your child’s name and say ¿Sofía, Sofía, qué ves allí? In the same rhythm you read the story. Then answer the question yourself, if need be. ¡Veo una manzana! It’s not a test, rather it is a way of recalling the context of the story and helping your child understand the language in another context. By the way, if your child likes Oso pardo, oso pardo, she might have fun with this Spanish Brown Bear I Spy and our other Brown Bear, Brown Bear activities. For an example of transferring language for older Spanish learners, take the chorus of the song Soy yo by Bomba Estereo. You can sing “Soy yo.” (over and over) when the opportunity arises. For example, when kids express an opinion about how you are doing something, when you walk into the room, or when they answer the phone when you call. You need to listen for useful phrases as you read, watch and listen to music, but once you start looking for them, you’ll find many. This is a very effective way to help kids transfer language from one context to another. Choose repeated phrases and say them with an expression that your child will recognize or sing the tune. Start with one or two sentences. Make it fun, don’t overdo it, and choose new phrases often enough to make it interesting. Poems have rhythm and rhyme and will expand your child’s vocabulary. I highly recommend reading, memorizing and reciting short poems as a family or class. 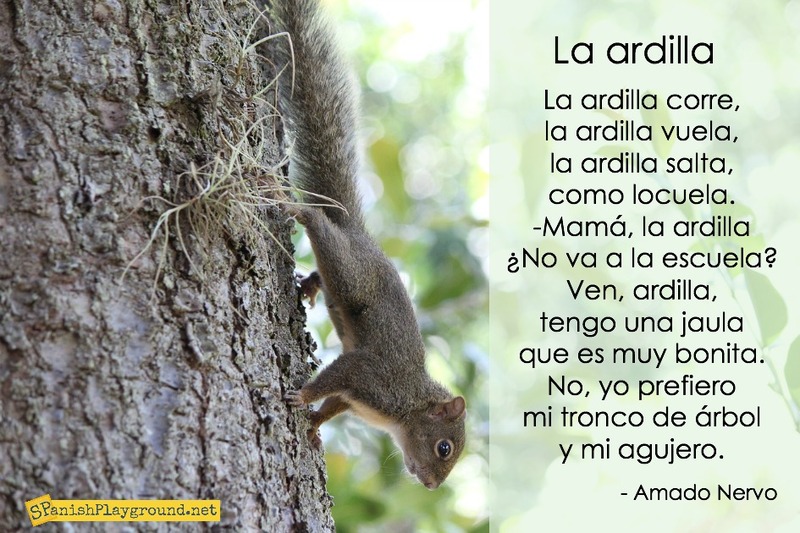 You can find many short, easy poems with activities for Spanish learners on our page of Spanish Poems for Kids. Two of my favorite resources are El jardín de Douglas by Douglas Wright from Argentina and The Poetry Friday Anthology for Celebrations from Pomelo Books. The Poetry Friday Anthology for Celebrations is bilingual and 35 of the poems have free audio tracks on Soundcloud. On a regular basis, pull out favorite Spanish songs, videos, books, and games from when kids were younger. Often there is more language there than you remember, and kids will appreciate it differently. As a general rule, skills in a minority language lag behind a child’s age. 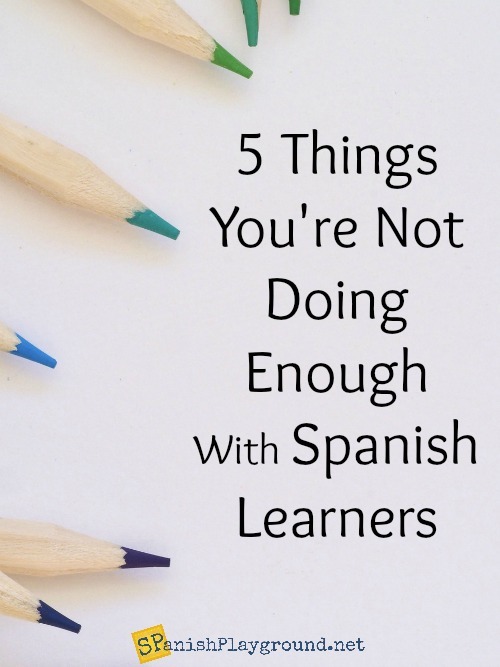 So, parents and teachers often struggle to find age-appropriate materials for Spanish learners. 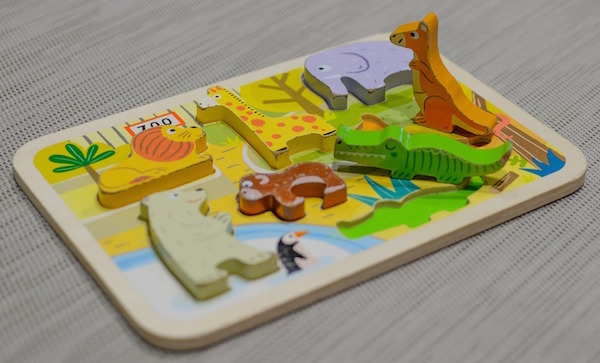 Of course, it is important to find high-interest material for their age, but kids learning a second language understand they need a lot of practice. They also have a real fondness for certain songs, books, videos and games. Revisit old favorites as a way to give kids continued exposure to a wide range of Spanish as their skills grow. Maybe start a family or class “Throwback Thursday”? 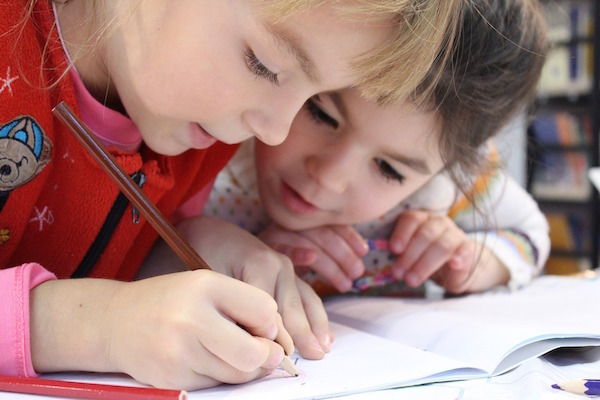 Connecting kids’ interests to language is a sure way to make it more fun. Kids all over the Spanish-speaking world are doing karate and ballet, raising puppies, biking and skating, learning to cook, building with legos, etc. Tap into authentic language resources like picture books, websites, apps and magazines to learn key vocabulary and build your child’s awareness of our global community. Choose resources with lots of images and don’t worry about understanding every word. You can also connect any trend to Spanish. From slime to bottle flipping, there are YouTube videos and kid-friendly web pages about the newest thing. Raising bilingual kids is demanding. So much so, that sometimes we keep doing the same thing because there isn’t energy to refocus. If what you are doing is effective, that is a good strategy, but often a shift of focus can be helpful for parents and Spanish learners. Best of luck on your bilingual journey!